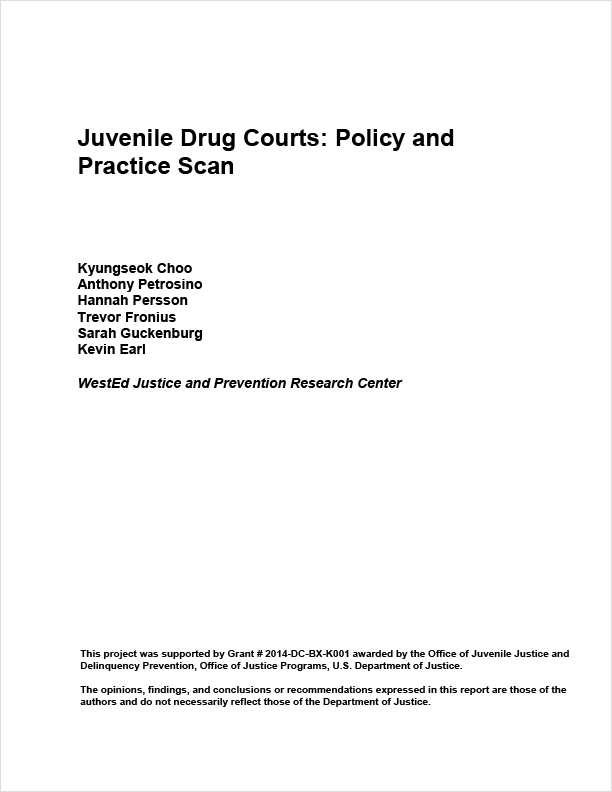 WestEd, as part of a research team on the Office of Juvenile Justice and Delinquency Prevention Initiative to Develop and Test Guidelines for Juvenile Drug Courts, conducted a policy and practice scan to provide data on a small sample of local juvenile drug treatment courts (JDTCs) in the United States. This report describes a sample of 25 local juvenile drug treatment courts, including their current operations and structures, challenges, and successes. Most JDTCs were funded by state government. Some also were supported by local or federal government funding sources. A wide variety of professionals and organizations were involved in JDTC partnerships, the most common of which were judges, court administrators, district attorney/prosecutor’s office, local treatment providers, probation department, and state/county social service agencies. All participating JDTCs provided substance abuse treatments. The majority of JDTCs offered mental health services and family services, including counseling for parents. The typical structure of a JDTC consisted of three major parts: intensive judicial supervision, treatment services, and community-based organizational support. The most common challenges were lack of funding, especially for supporting incentives for youth in the program and enabling sufficient staffing. The report concludes with implications for the development of future JDTC guidelines.